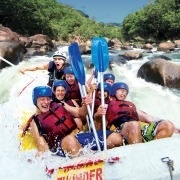 Experience the thrills and excitement of white water rafting, one of the most popular adventure activities in North Queensland. White Water Rafting offers an exciting and fun way to discover the pristine rainforest surrounding Cairns, magnificent gorges and breath-taking scenery. 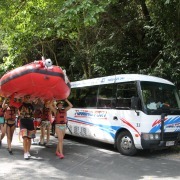 Departures are year round with your choice of half, full and multi day rafting adventures from Cairns. Tailored to suit the young, the adventurous, the active and the old, you can select a rafting adventure to suit your level of fitness and excitement; whether its thrills and spills you're after or a gentle float along the river, you can be assured that no matter what trip you choose you will be accompanied by qualified guides in full safety. Join the thousands of people every year who raft the Tully River in this extreme five hour white water adventure. The Tully River is located about 140 kilometres south of Cairns, which is approximately a 2 hour scenic drive through cloud-covered coastal mountains, clear rivers and fields of sugar cane. The river cuts a path through World Heritage-listed pristine rainforest, steep-walled gorges, and waterfalls. 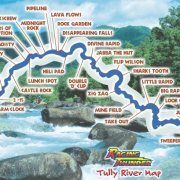 Tully River Rafting is a lot of fun with 27 rapids to negotiate on this grade 4 river, the professional crew will make sure you are safe and have a great time. Lunch is a delicious BBQ on the banks of the river surrounded by spectaucular scenery. If you are lucky you may catch sightings of water dragons and exotic birdlife. Water levels of the Tully are guaranteed all year round, no prior experience is necessary, but paddlers should be ready for a more active and exhilarating day of rafting. 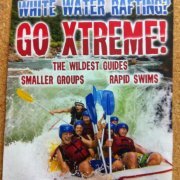 Xtreme White Water Rafting operates on the Tully River, specifically designed for those seeking small groups and BIG adventure. This exclusive trip tees up with the very best river guides, taking you on the wildest ride possible. Your guides will take you outside your personal comfort zone, to get the heart racing and your adrenalin pumping! This exclusive trip hits the river first, giving you the Tully at its absolute best, and allowing you to marvel at the magic of the World Heritage Rainforest, which surrounds on all sides. The Upper Tully Gorge is regarded as the best section of commercial white water in Australia. Falling from high in the valley, this section boasts constant grade 3-4 rapids, which are moderate technical rapids. Take the plunge and try raft surfing, rapid swimming and rock jumping. 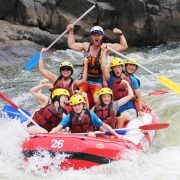 The Guides working for the Xtreme Team are chosen not only for their excellent river skills, but for their love of rafting and the natural environment. The Grade 3 Barron River half day tour is perfect for ages 13 to 99, all fitness levels, and is located just 20 minutes from the heart of Cairns. Offering guaranteed water levels year round, this trip is great for people with limited time or can be combined with other adventure activities to maximise your day. The Barron River is a fantastic introduction to White Water Rafting, no experience is necessary to raft these rapids. You will board the Barron River just downstream of famous Barron Falls, and get to float through some of the world’s oldest rainforest, past numerous waterfalls while enjoying the intimacy of the rugged and dramatic gorge. Surrounded by such a diverse landscape, the Barron River provides plenty of opportunity for unique wildlife sightings, including tree-kangaroos, spotted-tail quolls, and the brilliant blue Ulysses butterfly. Whitewater rapids with names like “Rooster Rail”, “Cheese Churn”, and “Hells Gate” ensure plenty of excitement to go along with all that sightseeing. The Family Rafting half day tour on the Barron River is a fantastic introduction to White Water Rafting for children aged 6 - 12 years. This fun and exciting activity uses 8 person rafts and 2 person sports rafts to experience both styles of rafting during the trip. Sports Rafts are two per raft with an adult and child in each raft. Children 10 years old and above can be in a raft without an adult. Paddling rapids graded 1 – 2, a high guide to passenger ratio ensures safety is first class with an emphasis on having a fun day. The dense rainforest that surrounds Lake Placid, provides outstanding scenery for a memorable trip. The Russell River is located 60 kilometres to the south of Cairns in Far North Queensland. The headwaters of the Russell River lie in the shadow of Mount Bartle Frere, Queensland’s highest peak, just outside of Mirawinni. An experience on the Russell River is much more than just rafting. 2 man sports rafts are carried down to the river on a single file track that used to be an Aboriginal fishing trail, and through the lush rainforest of Wooroonooran National Park. This all adds to the hands on adventure. After loading into boats you will get to enjoy three hours of continuous rafting which will take you through exciting rapids like “Pinball”, “The Three Stooges”, and “Rollercoaster”. Midway through the day, the boats pull over and boaters walk single-file through a small rock corridor to emerge in the middle of a thundering waterfall. Later in the day, the river narrows and flows through a small, steep-walled, basaltic gorge. Guides will sometimes stop at certain points to take advantage of great spots for rock jumping and for swimming in quieter currents. Sports Rafting takes place on the Barron and Russell River. 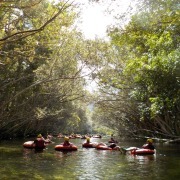 Sports rafts carry two passengers and are group guided under strict river guide supervision. 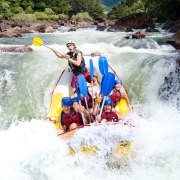 The advanced features of these crafts ensure stability so that you can confidently enjoy the excitement of white water. Skilled guides will show you how best to negotiate the rapids while they maintain a very safe environment in which you can enjoy the thrills. Departures are daily from Cairns and the Northern Beaches. Minimum age is 13 years. The Mulgrave River is located approximately 40 minutes south of Cairns. 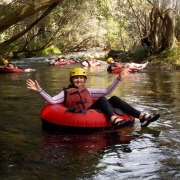 Tubing is very enjoyable, great for those with younger kids who want an adventure experience or for those who want to simply enjoy a relaxed, chilled out experience floating down a river whilst enjoying beautiful scenery. The rapids are gentle and fun. This tour is possible for even a 5 year old. There are a minimum of 2 fully certified and qualified guides on the water with you at all times. The North Johnstone is a steep, natural flow river that carves its way through a spectacular volcanic gorge. The Grade 5 North Johnstone Camping Trip is a once-in-a-lifetime experience. Helicopter in, and raft out over 4 fun filled awesome days. This is not for the faint hearted! The 4 Day Expedition rafting adventure is rated in the Top 10 wilderness adventures in the world, and is a once-in-a-lifetime experience! From the exhilarating helicopter ride in, through 4 days of gigantic Grade 5 rapids, breathtaking scenery and unforgettable companions, to the serenity of camping 3 nights under the stars in riverside rainforest clearings, you’ll never experience anything like it. With limited frequency of departures, restricted group sizes and stringent National Park permits ensure that the North Johnstone River and surrounding ancient rainforests are preserved for all time, enabling our rafters a rare glimpse of a very precious and untouched part of North Queensland’s World Heritage Rainforests.